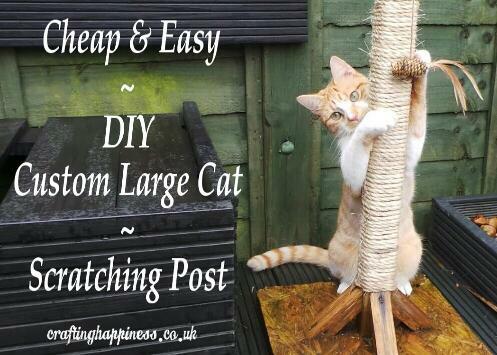 Today I will show you how I made this large cat scratching post cheap and fast. It's easy to make and can easily be adjusted to your needs. 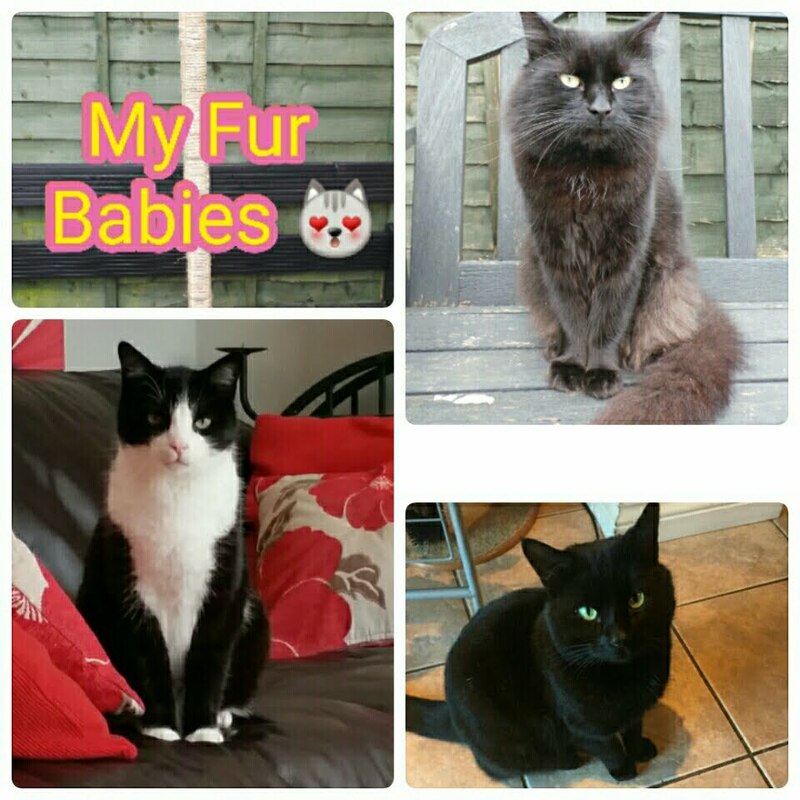 If you follow me on Instagram you know I have 3 beautiful cats, 2 black and one black and white, that are half indoors and half outdoors pets. They were all strays who came in one day and never left. What can I say? I love cats! 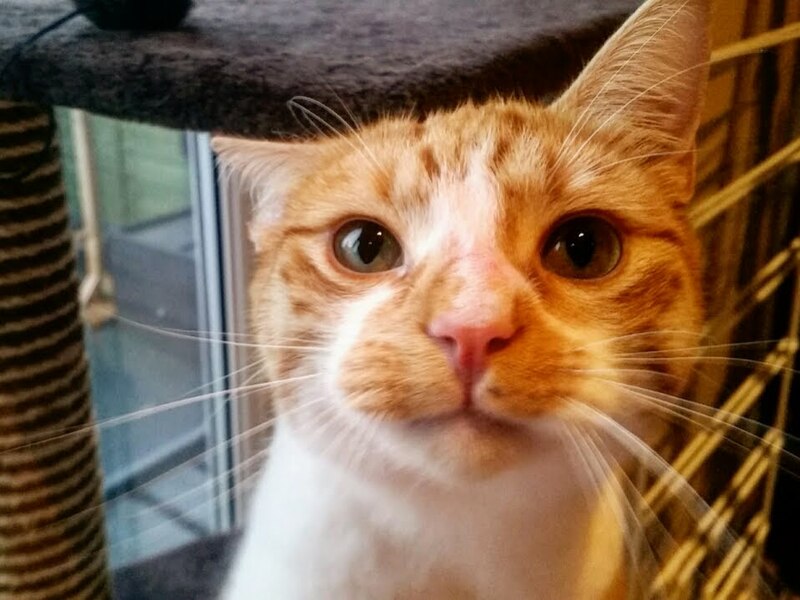 I am also sharing a ginger cat, Moshe, with my neighbour, he partly lives at my home but he belongs to my neighbour, so one could say I have 3 1/2 cats. 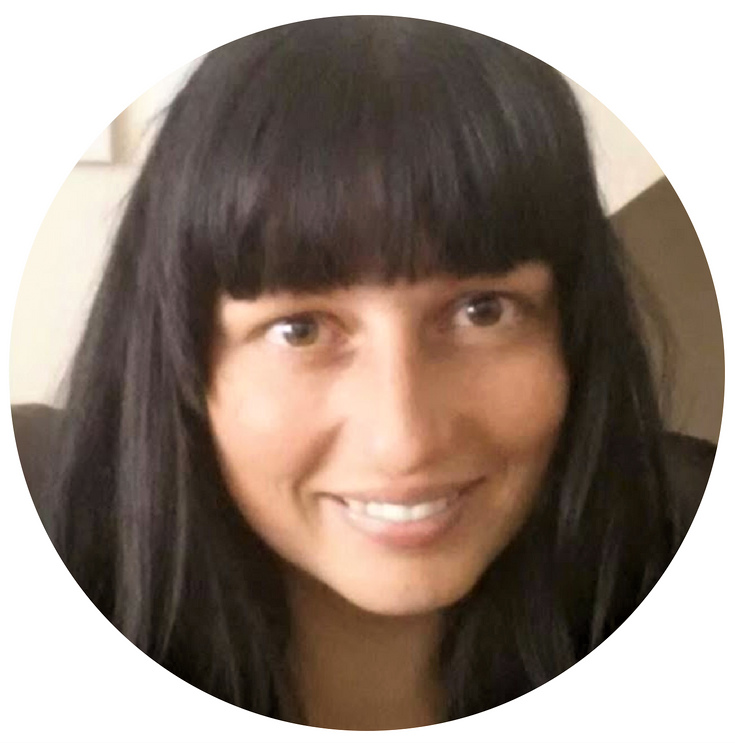 But cats have claws and they love scratching things with them and as much as I love my fur babies, I like my leather sofas too and would like to keep them intact, without any scratches on the sides, so I placed scratching posts and pads all over our home. Unfortunately, the store bought ones are not very sturdy, or tall for that matter, and having to buy one every two to three months was not making me (nor my wallet) happy so I decided to make my own. 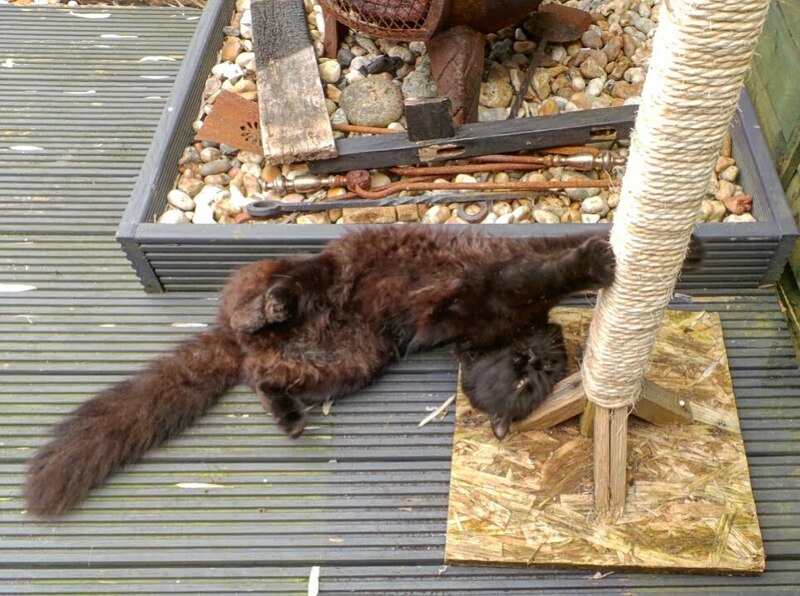 It was also important to have a tall scratching post because Twinkle, our oldest cat, is a large cat and he was always too big for the off the shelf cat scratching posts you find in shops. Since the summer is almost here, I thought I should make an outdoor one first and see how the cats like it and if they do, will make a couple more for indoors. 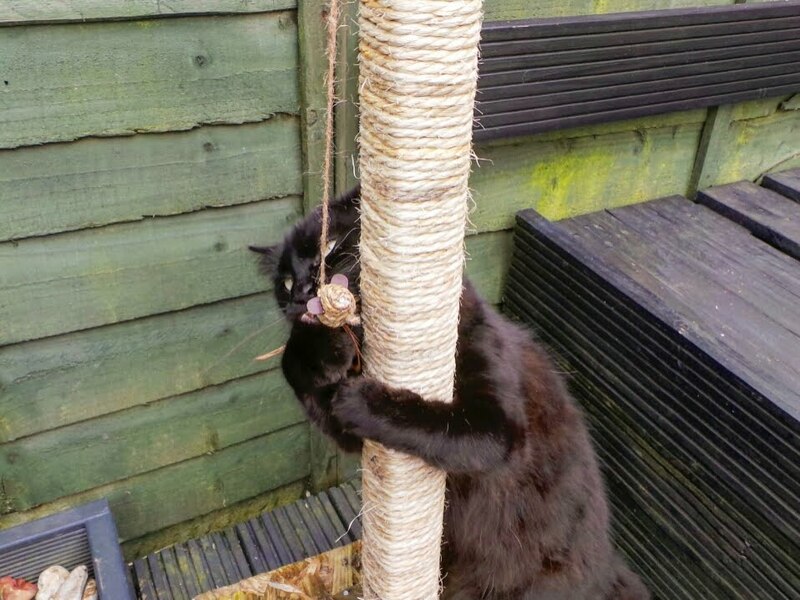 I decided half way through making it to add a mouse toy on a string to the top of the scratching post. I am not a carpenter and mr.B was busy with work so I had to be inventive and come up with something that will pass for a post. I had an old wooden bird house post that was lying around in the shed getting in everybody's way which I thought it was perfect for the job. 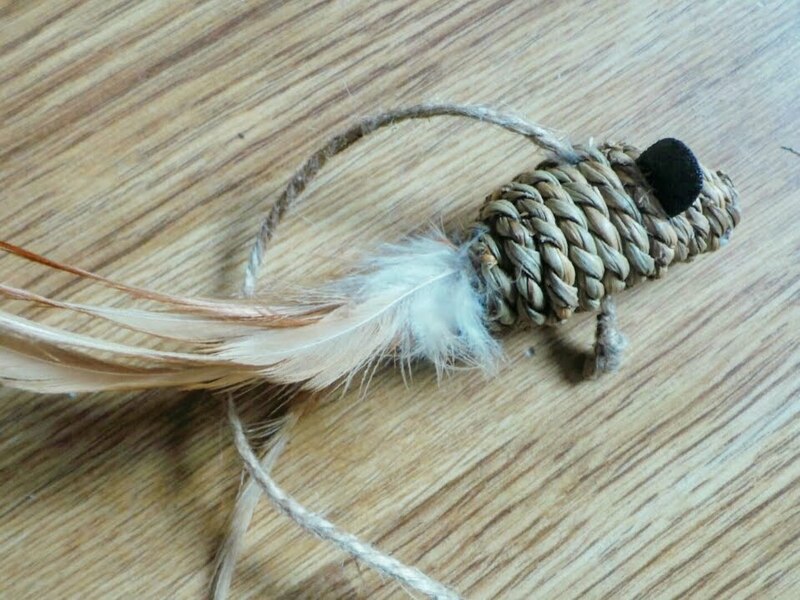 I will explain below how to make your own post, unfortunately I have no photos to show you, but it's quite easy if you like working with wood and have the tools. 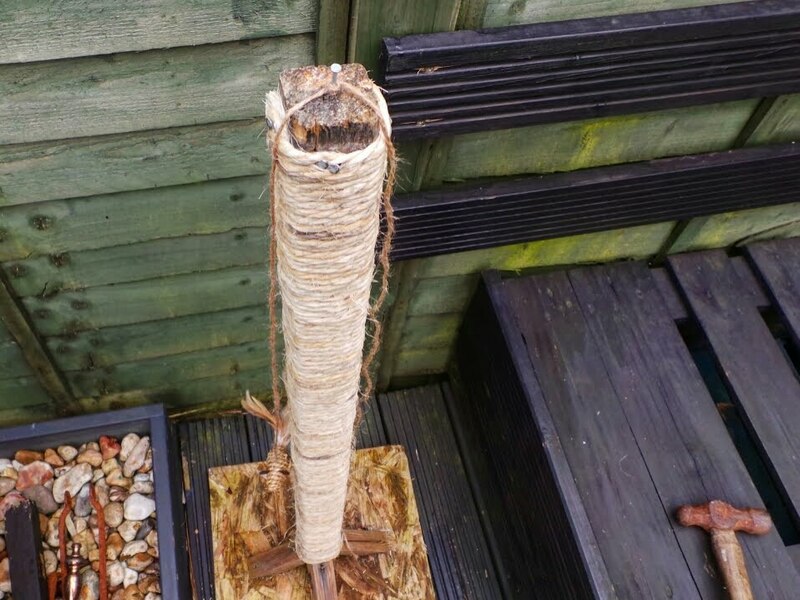 You can use virtually anything that stands upright as a post, you can recycle, just like me, a bird house post, even use the trunk of a living tree you have in the garden or a fence post, the cats will like it either way. 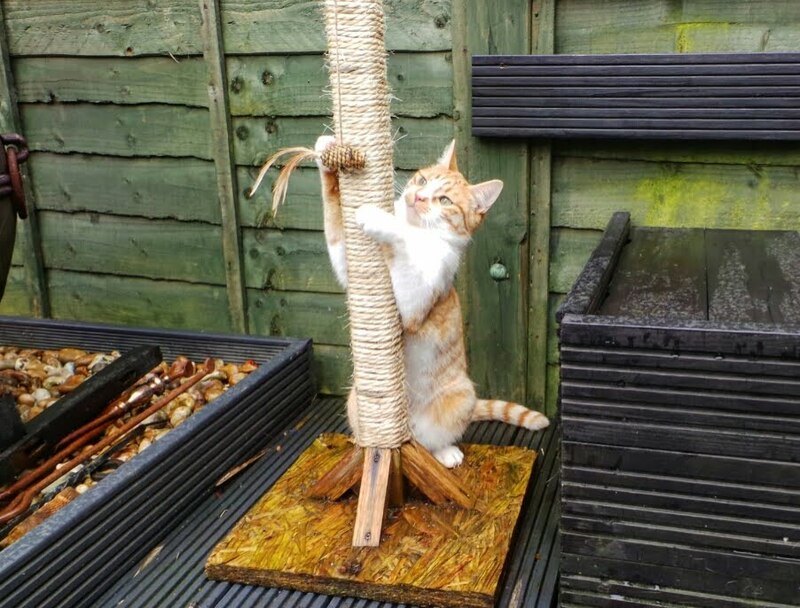 - Upright stand alone post the height of your choosing, I would recommend having it at least 80cm tall (taller if you have a large cat, they do like to stretch). The post does not need to be very thick, mine is 10cm by 10cm. 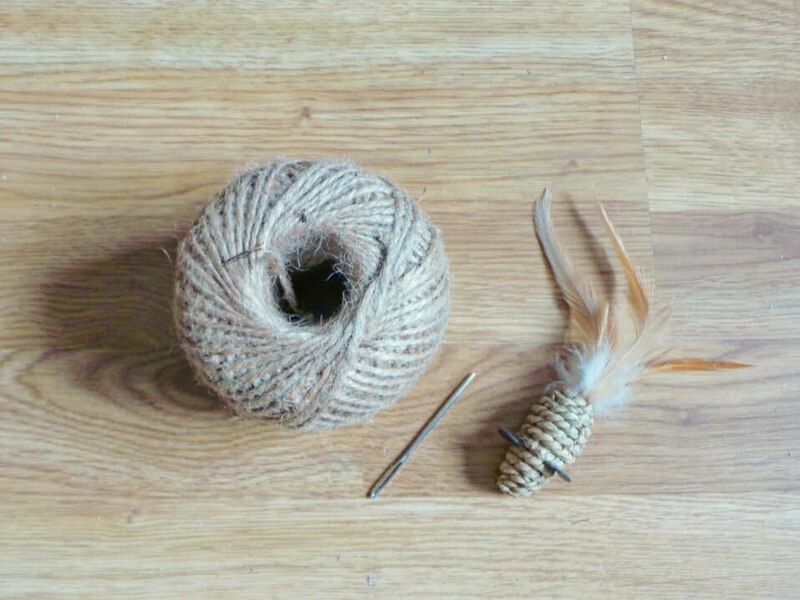 - 10mm Natural sisal rope. 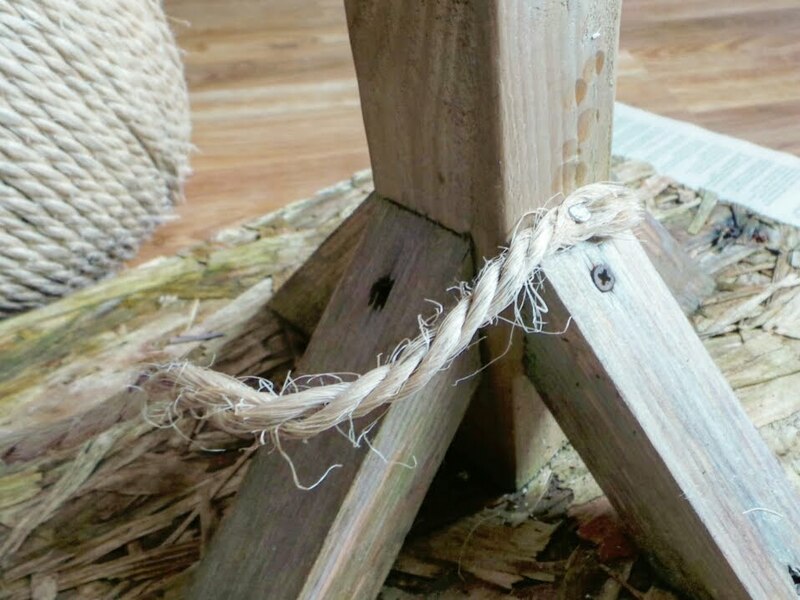 To calculate how much rope you need do the following: measure the circumference of the post (A) and length of the post in centimetres (just the area you want to cover with rope) (B) then calculate: A x B = how much rope you will need. - 4cm (1.5inches) wood nails. 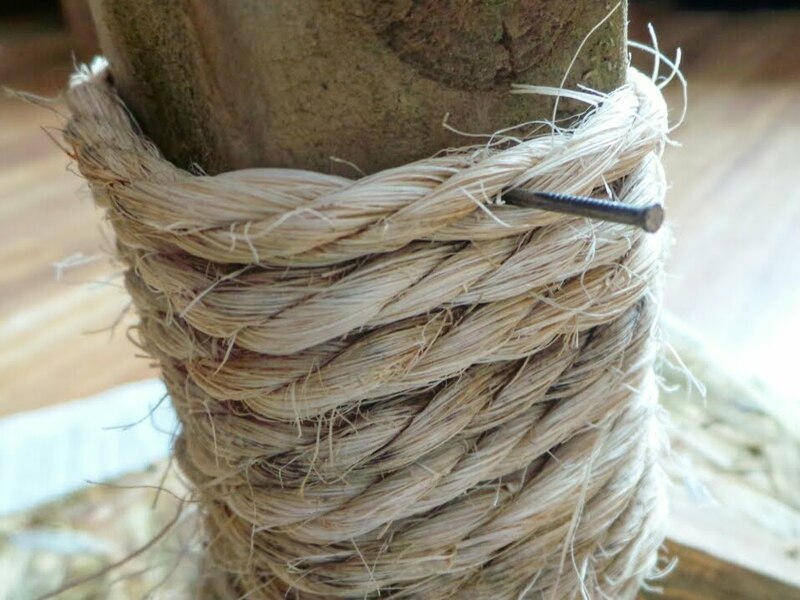 If you are using a concrete post, you could try gluing it with hard as nails. 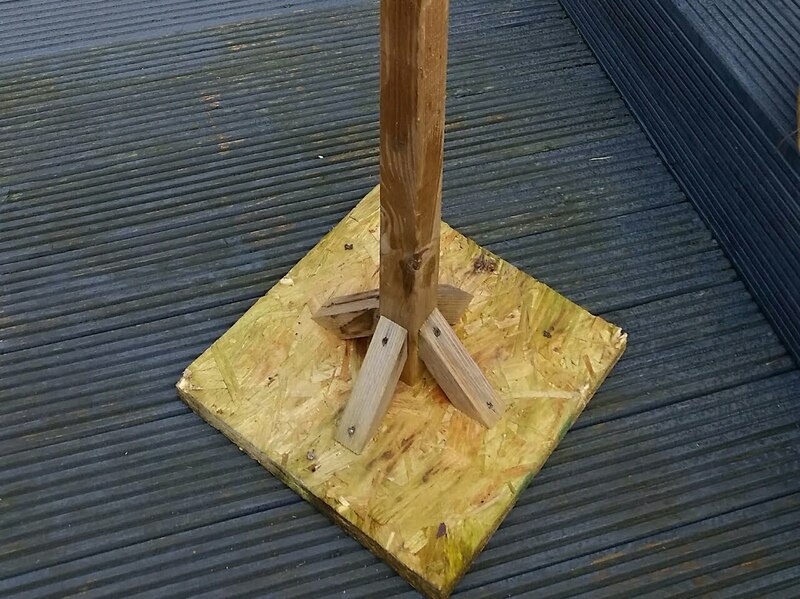 The post base is easy to make, all you need is a 4inch by 4inch piece of wood, 2 inches long wood nails (or screws if you have a drill), and a square piece of MDF 40cm by 40cm. Kitty being nosy as usual curious to know what I am doing. Cut 4 pieces out of the 4 by 4 wood, 15cm long each, then on each piece, cut each end at 45 degree angle. Cut the rest of the 4 by 4 wood to the length of your choice and. Place the MDF piece on top of the long piece of wood, centre it and nail it to the wood with a couple of nails. 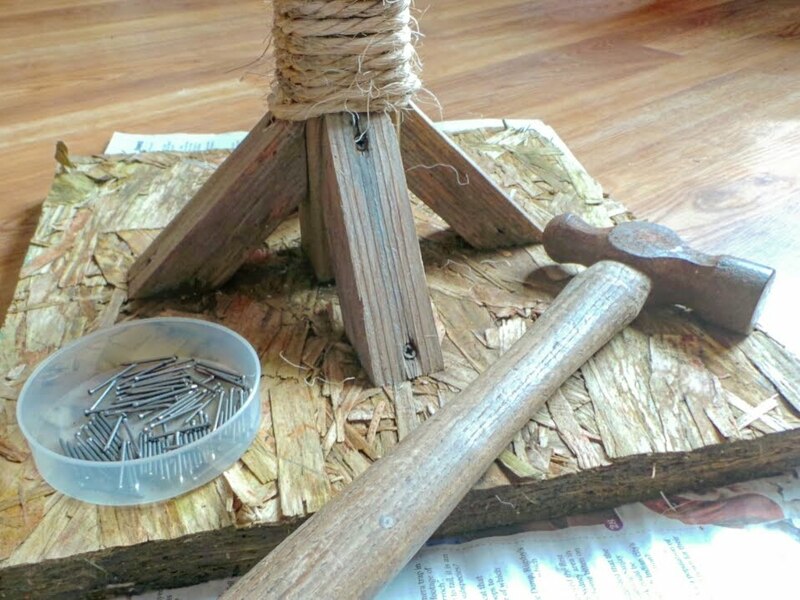 Turn the piece around and place the 15cm long pieces of wood adjacent to each other around the main piece of wood. Nail them to the MDF base and to the wood post. And the base is complete. Easy, right? 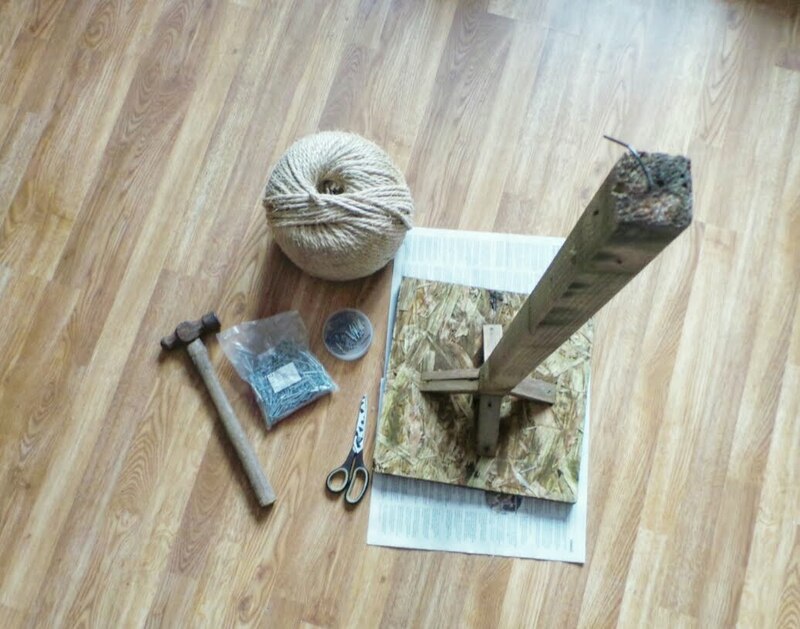 Optional, if you want to make it look pretty and keep it indoors, you can glue a piece of carpet or other fabric to the top and one to the bottom of the base before attaching the post. Putting the rope on is even easier. 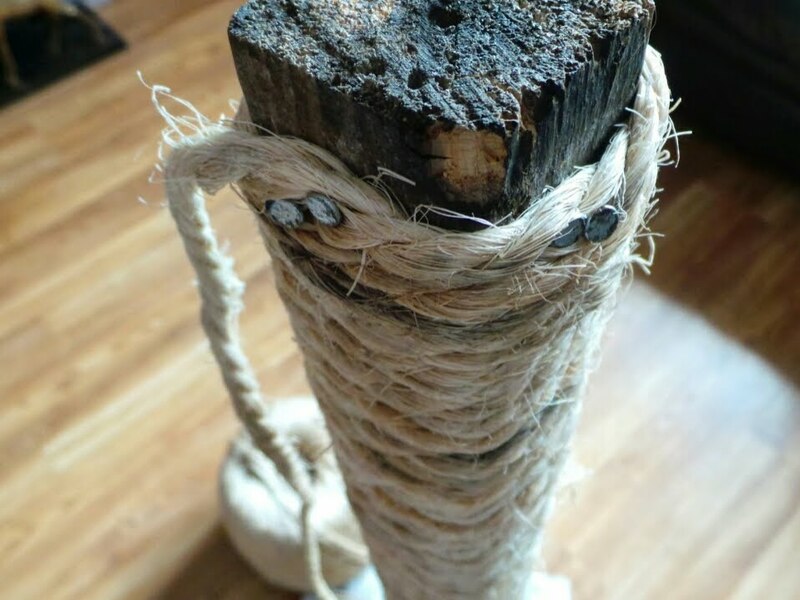 Secure the end of the rope with a couple of nails at the base of the post. Roll the rope around the post making sure it's tight. Every 5 to 10 centimetres, nail the rope to the wood. Continue to do so until the top. Secure the end of the rope with a couple of nails. Now onto the mouse toy. 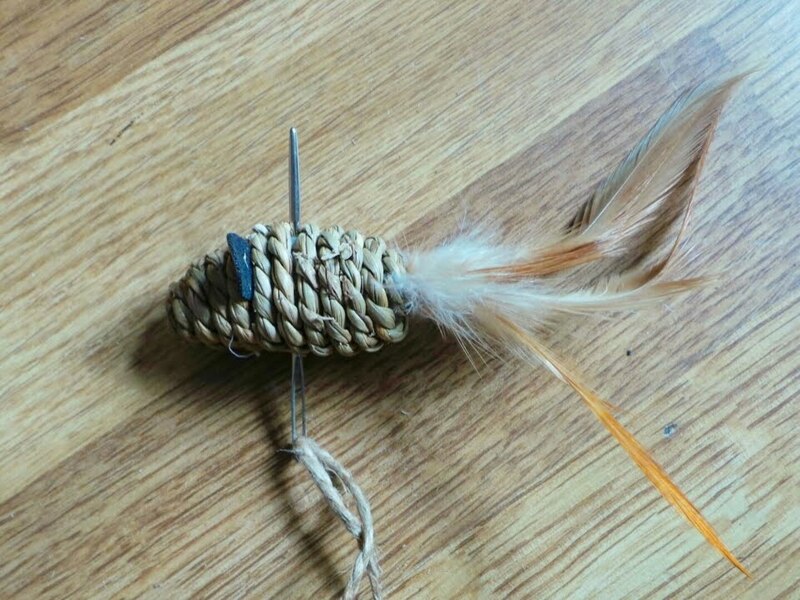 Use the needle to run the rope through the rope mouse. Make a knit at the bottom. 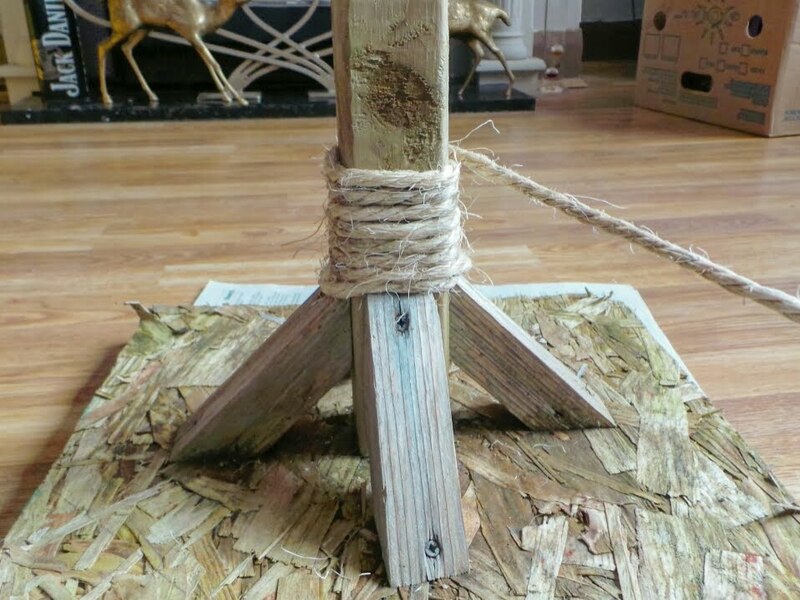 Then put a nail in the top of the base and tie the rope to it. 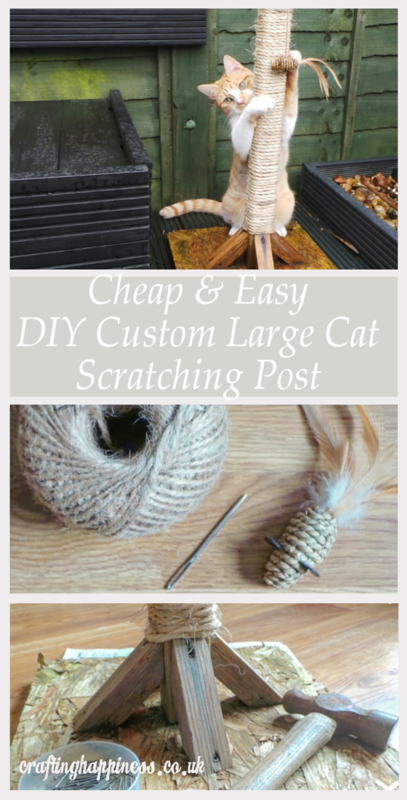 My cats loved the scratching post and the toy, I am sure yours will too. 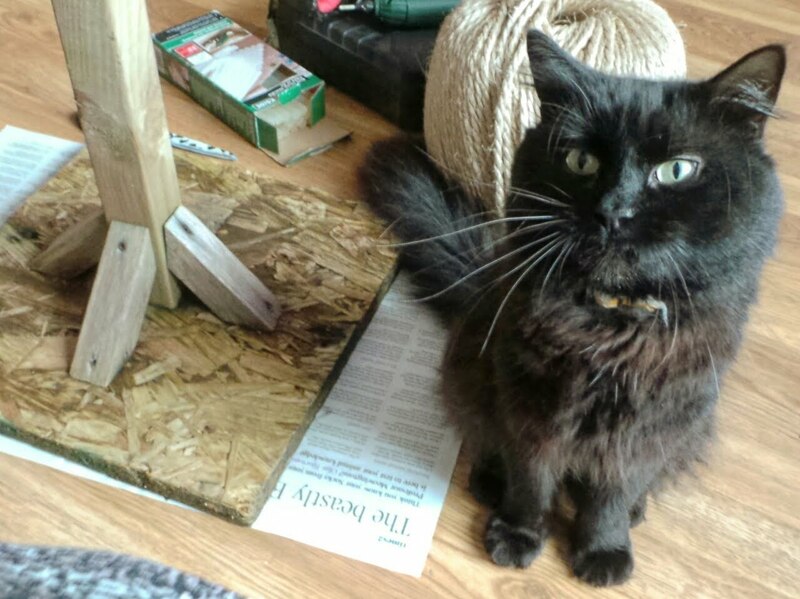 Doesn't take much to reel me in - as soon as you mention cats I'm interested! This looks great! Gorgeous pictures, too. What a good Idea! Thanks.